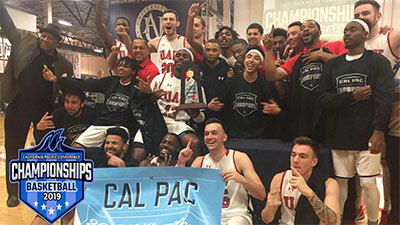 Top-seeded Antelope Valley outlasted #3 Embry-Riddle 65-56 in the finale of the California Pacific Conference Championship tournament in Lancaster, Calif., and claimed its second consecutive conference crown. The Pioneers, now 16-12 on the season, await tomorrow's announcement for seeding at the NAIA Division II National Championship, which will take place at Sioux Falls, S.D., beginning on March 6. While the victory was anything but a work of art, UAV has seen nothing this season more beautiful than another trip to the national stage. The Pioneers had a difficult time penetrating the ERAU zone defense, but their relentless defensive pressure, which caused 24 Eagle turnovers, and outstanding 3-point shooting marked the difference in the contest. In this year's first meeting between the two squads back in January in Prescott, Ariz., ERAU upset UAV 69-61. In the rematch in Lancaster, Calif., on Feb. 9, the Pioneers rolled to an 85-60 win, imposing their will on their home court. But in the third matchup, it was ERAU that controlled the tempo, and kept the game within reach throughout with defense and a balanced offense. Early in the game UAV sped out to a quick lead, and 15 minutes in the Pioneers had a commanding lead, hitting 3-pointers, applying full court pressure that forced turnovers, and controlling the boards. But even when UAV went 15 and appeared primed to pull away from ERAU, the Eagles battled through the pressure, even when the offense had difficulty scoring on the tenacious Pioneer defense. UAV built a 35-25 lead by halftime, but the Eagles came out attacked the rim and quickly pared the margin down to three, 36-33, on a treys from Gilbert Ibarra (6'3''-G-98) and Logan Skurdal (6'4''-G-96) and a Nick Johnson (6'5''-G-98) bucket with 16:39 remaining. ERAU kept it a two-possession game over the next five minutes, but Hayden Hall's three, his third of the game, with a little over 12 minutes left, put the Pioneers up by 10, 47-79, and the Eagles never got closer than five points the rest of the way. Five minutes later, Ibarra wound through UAV defense and laid one in to make it 55-49 with 7:25 remaining, but after a timeout, Hall, as he did so many times in the game, knocked down another triple to put the Pioneers back up nine, 58-49. UAV shot a sizzling 48 percent from beyond the arc, connecting on 12-of-25 3-pointers in the game. And the Pioneers needed all of them, as they were only 11 for 20 from the free throw line and finished with 23 turnovers against the active ERAU defense. The Pioneers averaged just under 80 points per game in the Cal Pac this season, but the Eagles did an outstanding job of taking away the Pioneers' inside game, most notably neutralizing Cal Pac Player and Newcomer of the Year, Christian Drayton (6'9''-F). ERAU held UAV's leading scorer to just two points on 1-of-7 shooting from the floor. Drayton did lead the Pioneers in rebounding with eight. Other Pioneers stepped up when needed. Hall had a huge shooting night, draining 5-of-10 treys and finishing with 18 points to lead UAV, and Miles Nolen-Webb (6'0''-PG-96) added 12 points and five assists. ERAU's breakthrough season comes to an end with a 16-14 overall record--which was not only the best in the program's four-year history, but it nearly doubled the previous most wins in a season (9). The Eagles will return many key players who now know what it takes to reach the postseason. Leading that drive will be Johnson, the Cal Pac Defensive Player of the Year and the team's leading scorer. In the season's final contest, he totaled 11 points, matching Logan Skurdal's 11-point effort. Johnson also had a game-high 10 rebounds, six on the offensive end.